Thousands of adults in Arkansas will likely lose their Medicaid coverage in a first-in-the-nation experiment to require people to report 80 hours of work or other activity to maintain their coverage. State data show that during the first two months of the Medicaid work requirement, implementation has been deeply flawed and has not achieved the state’s purported objectives – yet the state intends to cut thousands of people off later this week. In a state with one of the worst online connectivity rates in the nation, the only option for Medicaid beneficiaries to report work or community service hours is online. Few people have logged onto the website and two months into a three-strikes-you’re-out policy that locks people out of coverage if they fail to report activity for three months, more than 5,400 Arkansans could lose coverage could lose coverage after September 5th at 9 p.m. Though proponents claim the work requirement will incentivize people who are otherwise not working to get a job or start volunteering, there is no evidence from Arkansas that the new requirements are having the intended effect. A tiny fraction of those subject to the new work requirement are actively reporting 80 hours of qualifying activities, including work, volunteering, education and training, job search, job training, taking a health education class or meeting the SNAP work requirement. Most are instead receiving automatic exemptions for work, caregiving or other activities they already do. More troubling, a closer look at the data reveals that even the small number of people that are reporting activity has been inflated to make it look as though more people are working specifically to earn their Medicaid coverage. A significant majority of people reporting activity are already meeting the SNAP work requirement. They’re now subject to a new layer of red tape just to stay afloat. The July data from the Arkansas Department of Human Services shows that 844 people of approximately 44,000 subject to the new rules reported 80 hours of activity. 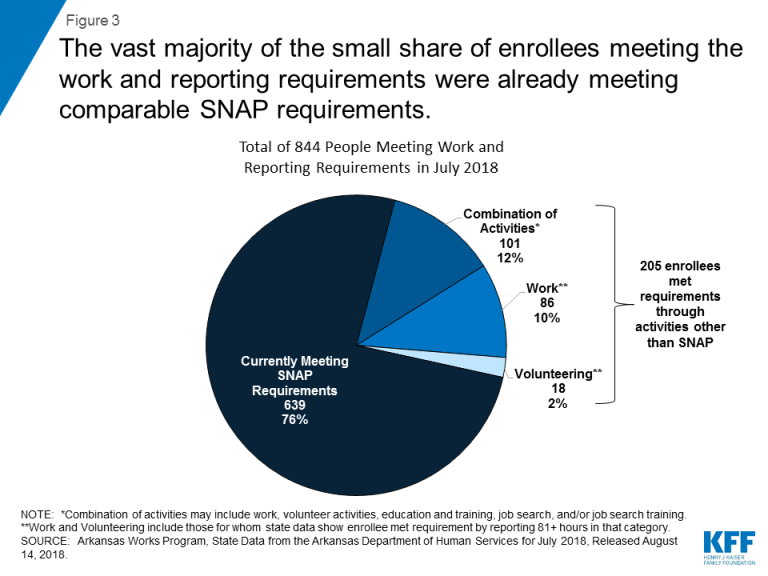 But within that small group of 844 people, 639 of them—76 percent of the population counted as meeting the requirement—were already working to meet the SNAP requirement. An issue brief on the July data from the Kaiser Family Foundation breaks out this finding in the chart below. The state also padded its June numbers with people already meeting the SNAP work requirement. In June, the state counted 445 people reporting 80 hours of activity, but 351 of them, or 79 percent of the total, were working to meet the SNAP requirement. When taking out the people meeting the SNAP requirement, the data shows that in both months, less than one percent of the total population of people subject to the work requirement (205 out of 45,365 people in July; 94 out of 25,815 in June) reported that they were doing 80 hours of an approved activity to meet the Arkansas Works requirement. The state’s report does not make clear if the one percent who reported 80 hours were engaged in new activity, or documenting something they were already doing. These results show that the Trump Administration’s high profile focus on work requirements in Medicaid is based on faulty assumptions. Most people covered by Medicaid already work, but in jobs with low wages and inconsistent hours, or that don’t provide insurance or offer coverage only at unaffordable rates. These adults are also the same group of people who are meeting SNAP work requirements, and are now being asked to attest their work to two different government systems. Another large segment of Medicaid beneficiaries are caregivers to small children, students, or medically frail and unable to work. So far, Arkansas Works doesn’t seem to be incentivizing work at all. However, what does seem clear is that the new approach (and others like it) will likely result in significant coverage losses for adults who rely on Medicaid coverage for their survival. And when that adult is a parent, the coverage loss is harmful to their children as well. Beginning tomorrow, those cuts become real.